I set up my account in June of 2010 — even though I wasn’t quite sure what to expect. I was skeptical to say the least. However, since it’s free to sign up, I figured I didn’t have anything to lose. 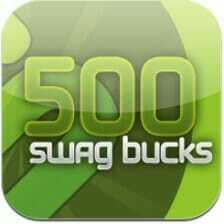 Swagbucks.com is an online search engine (like Google) dedicated to helping you earn digital dollars called “Swag Bucks”, which can be redeemed for cash, prizes, and merchandise. Swag Bucks is basically “free money” because you essentially get paid for searching the internet…which you do anyway. Depending on the number of Swag Bucks you have, you can redeem them for all sorts of prizes — including gift cards to Gap, Amazon, Starbucks, etc. Here is a list of more rewards. Searching: This is the easiest way to earn Swag Bucks. Instead of “googling” something just “swagbucks” it. Daily Polls: Get at east one free Swagbuck for voting on their daily poll — silly but simple! Surveys: The feture allows you to take short survey for Swag Bucks (usually 100-500 SB) It tells you how many surveys are available, how long it should take you & how many Swagbucks you’ll earn. Shop: Several online stores have partnered with Swagbucks…and you can earn 2 Swagbucks for every $1 you spend at these stores. Trade-In Program: Trade in old cell phones, MP3 Players, Video Games & Consoles and earn more rewards. Birthday Bucks: Make sure you enter your birthday into your account (this is a new feature) and you’ll receive 50 Swagbucks as a birthday gift!! Mega Swagbucks Day: Every Friday is Mega Swagbucks Day, which means there’s a greater chance of winning big bucks — so make sure to make lots of searches on Friday! Referrals – Share the wealth with your friends and you’ll both win! And there are even more ways to win! Still not convinced?? Check out their FAQ’s. Already using Swagbucks? What’s your favorite way to earn? Just signed up. Looks like a great site! By the way LOVE your blog! If you can refer me that would be great too! Would you suggest signing up with your Facebook profile? I’m torn about whether to do it that way or just sign up normally. I honestly don’t think it matters…either way would work well. I just signed up “normally” but Facebook could be convenient as well. Either way, it’s a great way to earn rewards just for searching the internet…and they add up fast! Thanks! I already signed up and earned a few points already. thanks for the detailed description!